"THE very dynamic of being a family-run law firm helps us understand what our clients go through. We see how a tragedy or serious injury affects not only the injured person but also their relatives and friends. This understanding comes across in our relationships with our clients and is demonstrated in our advocacy," says Rosalio (Ross) Munoz, Founder of Mission Legal Center. "Being a family business also allows for closer collaboration in meeting our clients' needs. Our personal strengths as individuals and as family members combine to give our clients the best and warmest care possible," adds David Munoz, Co-Founder of Mission Legal Center, and Ross's eldest son. Indeed the father and son team of Plaintiff attorneys—backed by Munoz matriarch Maria, and supported by younger son Bobby, who serves as the firm's case manager—works tirelessly to serve the needs of those who have been harmed or exploited at the hands of powerful, oppressive entities. The family's roots in law and service were first sown decades ago in El Paso, TX, where Ross began working towards his lifelong desire to "help the underdog." Even in his youth, Ross recalls having an innate sense of equitable justice for those he saw being oppressed at the hands of others. "As a teenager I found myself defending people and ideas of the disadvantaged. My favorite cartoons before that were Underdog, Superman and Tarzan. I also loved Rocky Balboa," he laughs. In some ways, Ross may have been viewed as an underdog in his own right. Neither he nor Maria had college degrees, when they found out they were expecting son David. "I was 20 and Maria was 19. We worked different jobs with different hours. I would work swing shifts while Maria was working day shifts. They were lean years," he recalls. Eventually, recognizing that furthering their education was not only vital to supporting their family, but also something that Ross and Maria craved, Ross left his job to attend college fulltime. "Maria supported the family and I made extra money playing in a rock band," he says. The financial hardship was all worth it. After graduating from college, Ross was accepted and given a full scholarship to Texas Tech University School of Law in Lubbock. Somehow between raising David and younger son Bobby, Maria was also able to attend college, while Ross completed law school. "We made it work," Ross says simply. The family of four eventually returned to their hometown of El Paso, where Ross began work as an associate in a medium sized Plaintiff's firm. "I learned the trade of Plaintiff's work, and I also took on the partners' pro bono family law cases and mandatory court appointments to criminal cases. After a few years, I discovered that many of the clients I was representing were those who I either brought to the firm, or who were pro bono or court appointments. It wasn't long before I discovered there was a vast disproportion between the fees I was generating for the firm, and my base pay. I had always envisioned working for myself, and being able to have the ability to make important decisions for my clients and my family, so I left the firm and opened my own office in 1995." Ross maintains the Munoz Law Firm in El Paso to this day. Meanwhile, oldest son David was growing up with dreams of his own to help people. However, in his mind's eye, he'd be helping people as a physician. "I wanted to be a doctor most of my life," David says. After majoring in biology, he further went on to earn a Master's Degree in Physiology. "I worked really hard to get into medical school just to be put on a year-long wait list. I was really bummed about it and my dad said 'Just try law school. If you hate it, you can go to medical school next year.' 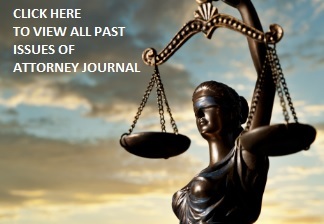 Within the first six weeks I knew law was where I was meant to be." David didn't know it at the time, but by studying the science of the human body, he was arming himself with incredibly useful knowledge and an invaluable understanding of just how devastating injuries can truly be to a victim. He would also soon find that his ability to easily read and understand medical records would prove extraordinarily useful in his work as a Plaintiff's attorney. Although Ross had a thriving practice in Texas, and had served as a Small Claims Court judge for a dozen years in Texas, he and Maria had always harbored dreams of moving to San Diego. "San Diego was one of our favorite vacation spots and we always dreamed of living here," says Maria. Thus, when the real estate market and ensuing recession hit, Ross and Maria came to invest in a summer home with plans of one day retiring in San Diego. "David and Bobby were living in San Antonio, and we called to tell them the news. They were excited and said that if we moved, they would move with us. The 10-year plan turned into a 6-month plan," Ross says. Upon arrival in San Diego, David and Ross set about to immerse themselves in the San Diego legal community. "We began networking immediately. We joined the Chamber, and Consumer Attorneys of San Diego, and we researched other Plaintiff attorneys who were very visible. We paid a number of visits to various Plaintiff's lawyers to introduce ourselves. They were incredibly helpful and hospitable and gave us pointers and wished us well. Many of them seemed pretty intrigued by our father-son dynamic," David says. David does admit that although he was excited to launch the firm with his father in their new city, the two weren't immune to the growing pains of launching a new firm. "In the beginning we clashed a lot on how anything was done. My father had experience in running a law office with all of the ups and downs and different hats he had to wear to run his office and Court. I was eager to make the firm as technologically advanced as I could. In the end, we have found a good compromise while making sure we adapt to the times," he says. To that end, Mission Legal Center became paperless, and utilizes cloud computing, voice over IP and various other technologies that make their office efficient, mobile, and accessible from anywhere. "We believe it's important to adapt and utilize anything new that can help us in both the office and trial presentation," David adds. To further ensure that the office would run efficiently, Maria, who had previously been Vice President of a bank, took the reins as Office Manager of Mission Legal Center. Initial hiccups aside, Ross and David shared the same conviction for how their clients should be served. "Our personal injury clients truly need help. They have probably been ignored or treated poorly by an insurance company and want us to take over and make things fair. We also represent clients who have a case for a Jury Trial," says David. As such, he says, "Every aspect of our firm is geared toward client comfort. They have already been through enough stress; they shouldn't be intimidated by their lawyer, too. Everyone in our office is hand-picked to ensure there is a comforting environment. The office is designed to be modern, yet soothing. We are friendly and reassuring. We personally meet with each client and prepare the intake, and although we encourage them to feel comfortable and confident in our staff to answer their questions, we frequently provide updates personally. We contact clients regularly to see how they are feeling, and how their treatment is going." "We also speak Spanish. It is scary to go through a lawsuit, particularly if you don't speak the language well. Being able to communicate to clients in their native language calms their nerves and gives them confidence in our firm and their case," says Ross. David and Ross also share a belief that costs should always be kept to a minimum for the benefit of the client's recovery. "We are very cost-conscious. Many lawyers will run up costs without thinking about it. At the end of the day, this is the client's money, and unnecessary expenditures result in the client losing money in their net recovery. We spend only what is necessary for the case. We run our office efficiently. Many firms take business loans out to survive. We have never taken one dime from a bank to pay our expenses or to launch the firm. Being a lawyer is only half of the job. You also have to be a business owner. Your family, employees, and clients count on you to keep the business up and running," explains Ross. Suffice it to say, the Munoz family has kept that business running remarkably well and has earned a solid reputation amongst peers and clients alike due to their skills, compassion, and impressive results. In fact, today a whopping 90% of their business stems from referrals. "Ross and David are cut from the same cloth," says Maria. "They both love trial work. Standing in front of a judge and jury, pleading their client's case and getting them the justice they deserve, is what makes them happy." "We have tried cases for other attorneys who have reached a stone wall with the insurance companies, who refuse to pay a reasonable settlement for their clients. In those cases, we have doubled or quadrupled the insurance company's top offer," says Ross. "Fellow attorneys have always been pleased with how we handle cases and care for their clients. Receiving a great referral fee doesn't hurt either," adds David. Other cases have been referred to David and Ross from opposing defense counsel, jurors from trials, or physicians. "Medical providers send us clients because they trust us to make sure they are fairly paid and the client/patient is justly compensated. Too many attorneys will not pay medical providers or pay them very little, despite the superior care they have provided their patient," he says. With a bustling firm that is growing each year, Ross and David have plans to remain in the heart of the San Diego legal community for years to come. But they still have plenty of goals. David, who was named a Rising Star by Super Lawyers, and has been included in the San Diego Business Journal's Best of the Bar, will return to the Gerry Spence Trial Lawyers College this fall for the graduate program. In addition, he says, "I try to take every trial CLE available, so that I'm constantly learning and improving my skills." As for Ross? He's planning to continue growing his mediation practice in addition to juggling a busy book of clients. The Munoz family as a whole also looks to show appreciation for what they have had the opportunity to do with their lives through charity work—often benefitting the homeless and orphanages. They also love participating in the Mission Beach cleanup every year as a way of giving back to the city they love. Father and son also intend to remain very active with CASD, which they say has introduced them to terrific attorneys who share their drive to help others. David says, "Consumer Attorneys of San Diego turns your firm from a few into a few thousand. It builds us all up, so we're better lawyers. We are united in trying to help people. We may be relatively small as individual attorneys but we are taking on huge companies who have a lot of money. I can't speak for everyone, but I know that my father and I do this work because we want to be proud of what we do, plain and simple. We help people when they need it the most; we represent the little guy. We can't change what has happened to many of our clients, but we can at least steer things back in their direction to achieve justice."